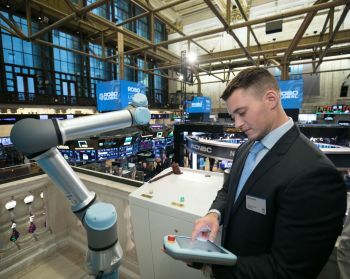 The ringing of the closing bell on October 17 at the New York Stock Exchange (NYSE) was highly unusual as the prestigious task was performed not by a human, but by a robot arm. The bell ringer, Universal Robots' UR5e with a two-fingered gripper from Robotiq, is a collaborative robot -- or cobot -- able to work alongside people with no safety guarding, giving watchers worldwide the opportunity to see just how easily cobots interact with humans. Cobots are now the fastest growing segment of industrial automation, expected to jump ten-fold to 34 percent of all industrial robot sales by 2025, according to the International Federation of Robotics. Universal Robots (UR) pioneered the market by selling the first commercially viable cobot in 2008 and has kept its early frontrunner position with a 60 percent global share of the cobot market, selling more cobots than all competitors combined. This fall, the company announced the sale of its 25,000th cobot. 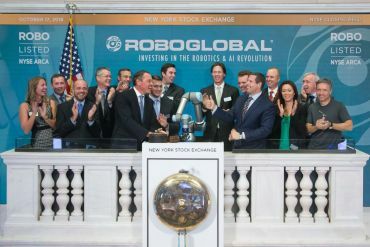 "We have long admired UR as a pioneer and global leader in the collaborative robotics market," said Travis Briggs, CEO of ROBO Global U.S. "Since acquiring UR in 2015, Teradyne has been a key growth driver in the ROBO Global Index. 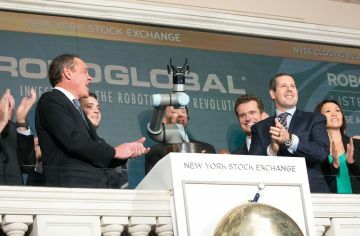 We are thrilled that Teradyne generously agreed to join the ROBO Global team for this one-of-a-kind NYSE bell ringing." Representing UR and Teradyne was Stuart Shepherd, Regional Sales Director of URs Americas Division. "With this event, we celebrate not just the success of robotics in empowering customers and investors, but also the successes of our customers in innovating and changing their workplace with cobots," he said. "The bell ringing reflects our continued commitment towards making cobots an easy-to-integrate piece of a company's operations platform."